Tarps Plus has brought in more red poly tarps in many different sizes. The red poly tarps are 14 mil thick and 6.0 oz per square yard they are also mildew resistant, tear resistant and lets not forget water resistant. The red poly tarp comes in sizes from 10x12 to 50x50 and is a fantastic tarp. The red poly tarp can be used for coverage, cover cars, cover a roof, used as a canopy cover replacement but most people use it to promote emergency. 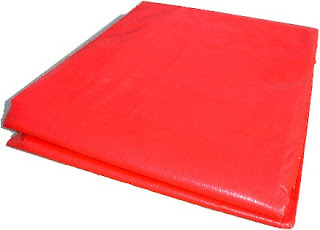 Our red poly tarps have great pricing and great quality you cant go wrong with the red poly tarp . Take a look at our red poly tarp section on Tarpsplus.com. I bought your red poly tarp as a cover replacement 6 years ago and now im back again to buy a new one. It is great that I don't have to buy a new one every year.